1. See the introduction of Discussion Guidelines in the previous blog. 1. 1. May I be the leader of this group? I need the group’s permission because I only lead those who give me permission to be the leader. I may have the authority. My name may be on the brochure or church letterhead as preacher, elder, or Bible class teacher. But if the group doesn’t give me permission to be the leader, I will not lead. How much authority does Jesus have (Matthew 28:18)? How many people is He leading? Jesus is only leading those who give Him permission to be their leader. Many are invited, but only those who desire take the water of life (Revelation 22:17). He wanted Jerusalem to follow Him in protection. But they were not willing (Matthew 22:37). I don’t have the authority of Jesus. I will not be the leader if the group doesn’t give me permission. 2. 2. Will we start on time (WWVB; www.time.gov, +, - 15 seconds)? We penalize those who come on time when we wait for late-comers. Often the question is not whether we will start on time but when is it time. I use a radio controlled watch and clocks. They are synchronized by the National Institute of Standards and Technology radio station WWVB in Ft. Collins, Colorado. 3. 3. Will we quit on time? 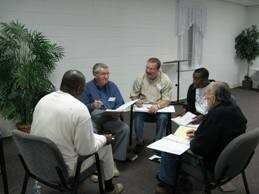 Especially in a workshop setting, this helps the group learn to operate within limits, boundaries. That is the way the world operates. It is a good practice since it respects everyone’s time.